Or, in homage to the style of the evening, how do you solve a problem like the occupied territories? There is no doubt that Theatre Ad Infinitum’s new production, first seen at Edinburgh and subsequently taking the old-fashioned route of touring the country before pitching up for an extended stay at the Battersea Arts Centre, takes on contentious subject matter. 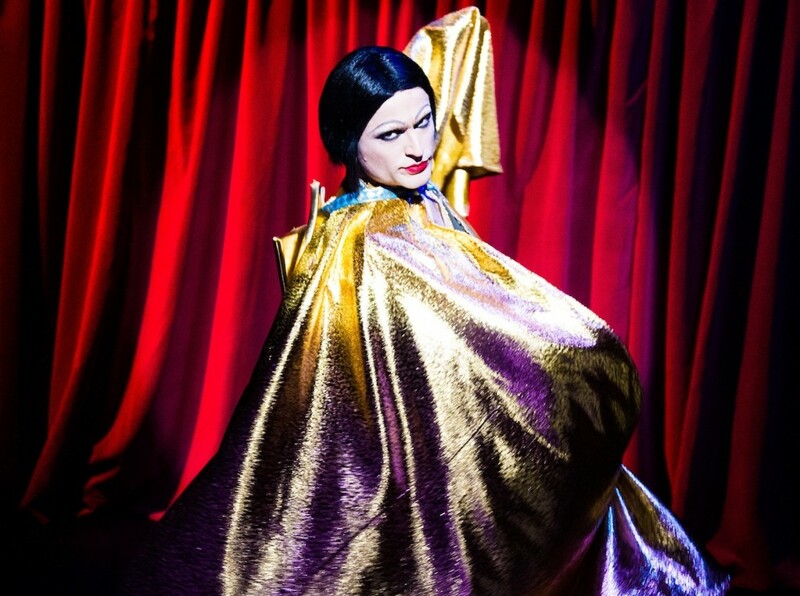 That the story is told through a drag queen and her cabaret troupe is a fun but rather unsurprising mechanism. Once a radical device, these days it continues to serve as a useful alienation device and, in the case of Ballad of the Burning Star, the issues remain so sensitive that it is critical for depoliticising the very act of storytelling. The events we hear are shocking but if told as straight narrative then perspectives of the characters would be caught in the surrounding context and events discarded as being irrevocably biased. Or alternatively the play would try so hard to capture both positions that the value of the final product is fundamentally undermined. We are told this story by MC Star and her Starlets, and through this prism the story is seen to unfold in a Brechtian manner. At no point is there any expectation that what is being seen are to be understood as real Israelis or Palestinians, the audience is reminded throughout that they are being shown representations of a family, and representations of real events. This allows certain latitude to extract humour from the story, characters are able to step outside of their roles and comment on proceedings and it allows the development of a duality and tension between the increasingly autocratic Star and the actions of Israel in the occupied lands. That Star is played by writer and director Nir Paldi hints of a biographical nature to the story, and throughout this feels like a passion project that has developed a life of its own. It is also embeds a sense of truth that often only comes from a person with first-hand experience and, in this case, has been at the sharp-end of the consequences of forty years of regional foreign policy. Any story must be understood within the context of its creation. The story of Israel, the lead character in the show, like so many narratives around the state of Israel, must be understood within the context and implication of the wider story of Jewish history. Israel, the character, and Israel, the state, are separate individuals but share such a common history that the two must constantly struggle to be separated. The state and the individual share the collective memory of the Holocaust, and the legacy of the historical persecution of the Jews through Europe and the Middle East is reinforced to create a state of mind of clinical defensiveness. Both individual and state cannot be understood without understanding this context. How much you enjoy Ballad of the Burning Star will at least partly depend on how much you agree with the story devised by Nir Paldi. And this is likely to be tied to your position on the actions of Israel and the neighbouring Arabic states following its creation. Whilst enjoying the evening I could not help but think that it rather neatly fits into the left-wing liberal mould of the enlightened settler who experiences the sharp-end of those they occupy but can still find it within themselves to forgive – and as a result the question is raised over whether I enjoyed the show primarily because it fitted with my pre-existing biases? Looking more objectively there is a rough and ready feel to the show that wasn’t apparent with their previous work, Translunar Paradise. Some of that is deliberate as it seems clear that we are not supposed to regard the cabaret troupe as a fully professional outfit but at times this tips to far into anarchy and in the excitement lines of dialogue do get lost. The use of cabaret is excellent and can’t help but bring to mind images of Joel Grey and the girls at the KitKat club; a useful reminder in itself that using cabaret and vaudeville as satire has a long and distinguished history in the theatre. The Starlets are excellent and move seamlessly between their multiple roles. Mention should also be made of the excellent musicianship and sardonically amusing Pete Aves as ‘Camp David’ (hands down my favourite joke of the year so far). The show just about manages to keep the wheel spinning at its furious pace for eighty minutes and, like all well-crafted drama, its pace is used to build to a devastating climax. As it occurs you remember that it had been clearly foreshadowed but it is testament to the production that it still packs a powerful punch. Nir Paldi clearly understands that even using a sledgehammer to make your argument demands a certain subtlety. The audience are shown the recurring pain and tragedy that cannot help but run through the experience of every Israeli Jewish person. The grandmother reflects the fear of history and the tragedy of the past, the present terror is seen in the loss of a son and the brutal reality of war experienced by the father. Paldi never uses these experiences to justify action but leaves an open-ended question over whether this inevitably produces the conditions for complete defensiveness. The dual narratives and Star’s increasing autocracy and bullying of the non-Israeli nationals in the troupe also seems to play out an idea that a state that, through its schooling and its culture, engenders an overarching sense of persecution and suffering also leads to the creation of a tunnel-vision of madness and control. These are big issues and Ballad of the Burning Star never attempts to explain or justify. The purpose of this show is to present a story and to use that story to raise issues that might explain a little bit more about the world. It is a brave show and a personal show and, if it does not reach the sublimely technical heights of Translunar Paradise, it marks the continued development of Theatre Ad Infinitum as a company dedicated to powerful, challenging theatre. Well here is a trailer. Well here are more opinions.